Radical and practical guide to help us gain a greater understanding of who we really are and why we are here. Love is to the spiritual Universe as gravity is to the physical world. An understanding of love as the only true power, the fundamental and basic structure of all life and being, leads to a new view of life and truth that leads to wholeness, happiness and healing. 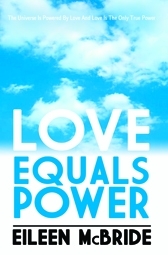 Love Equals Power provides an entertaining and compelling discussion of the big questions of life, offering answers that are both radical and inspiring. Drawing on her own lifelong experience with spiritual healing as well as her wide-ranging research of different spiritual practices and theories, Eileen McBride argues that all true knowledge lies within us and is accessed through love. Love Equals Power provides not only the ideas but also the practical strategies to harness all the power needed to find spiritual solutions to human problems, to heal our bodies and lives, and to create the life we truly desire.